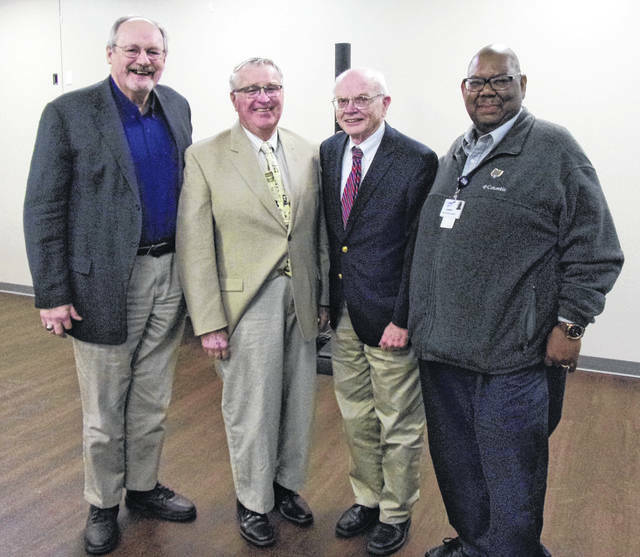 Wilmington Kiwanis Club had a interclub meeting with the Xenia Kiwanis Club on Tuesday, March 12 in Xenia at the new Xenia YMCA & Senior Adult Recreation Center. Guest speaker was Clinton County/Sabina Resident Gary Kersey speaking about the 1884 Grover Cleveland presidential campaign. From left are Xenia Kiwanis Club Program Chair Kiwanian Mike DiCuirci, Kersey, and Wilmington Kiwanians Mack Fife and Vermon L. Dillon.